Are electric cars bad for the environment? I was alerted to this story by the Globe – which this morning is trumpeting going behind the paywall as “access for all” (Orwell would be proud: newspeak lives). I am not going to link there since they were in any event simply recycling something. Not – I hasten to add – plagiarism. Just what we all do – and in this case adequately cited, though without the necessary web links. Which of course Google gets quite quickly. 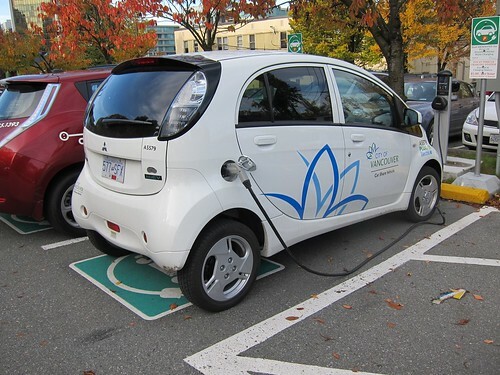 The Comparative Environmental Life Cycle Assessment of Conventional and Electric Vehicles is available from the Wiley online library – and since it has yet to appear in the paper version of the Journal of Industrial Ecology you can get the whole thing as a pdf though that may not last for long. What the Globe was doing was reporting on an on line discussion on Leo Hickman’s blog – part of the Guardian’s web presence – and one that I freely admit I had missed. The production phase of EVs proved substantially more environmentally intensive. Nonetheless, substantial overall improvements in regard to GWP [global warming potential], TAP [terrestrial acidification potential], and other impacts may be achieved by EVs powered with appropriate energy sources relative to comparable ICEVs [internal combustion engine vehicles]. However, it is counterproductive to promote EVs in regions where electricity is produced from oil, coal, and lignite combustion. The electrification of transportation should be accompanied by a sharpened policy focus with regard to life cycle management, and thus counter potential setbacks in terms of water pollution and toxicity. 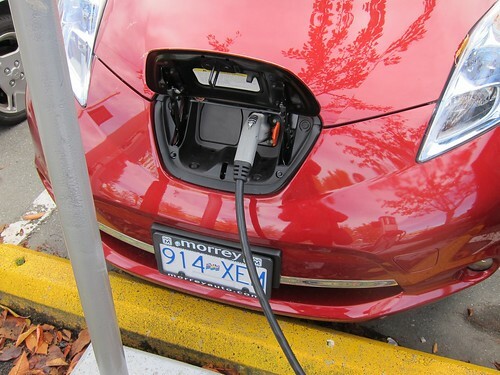 EVs are poised to link the personal transportation sector together with the electricity, the electronic, and the metal industry sectors in an unprecedented way. Therefore the developments of these sectors must be jointly and consistently addressed in order for EVs to contribute positively to pollution mitigation efforts. All of which is fair enough since all they are doing is comparing one sort of car to another sort of car. Which is why the big problem of electric cars gets completely missed. As I have often written on this blog the problem is the overuse of cars – far more than how those cars are powered or constructed. 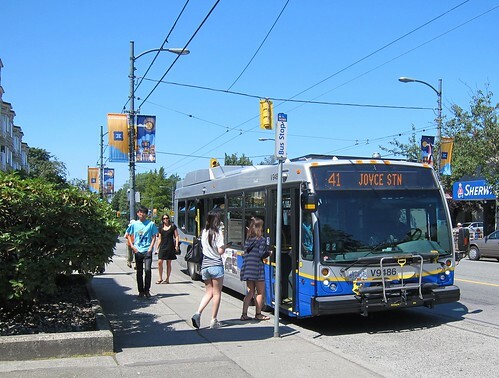 As a policy issue in urban areas – and after all most of us live in urban areas – what we need to confront – here and elsewhere – is that when most people use a single occupant vehicle for most of their trip making, the consequences are dire. Traffic congestion is the one that gets most noticed, as it is the most obvious, but add to that the horrendous toll on life and limb caused by collisions, the health impact of not using your own muscles enough and being sedentary for most of the time, and the sprawl of urban areas onto productive farm land and essential natural areas (loss of biodiversity and the greenhouse gas collection function of forests are merely examples). I find it offensive that I am being accused of “a rapture of techno-narcissism” when I have long been advocating some very old fashioned ideas. Electric trains, trolleybuses, and trams as well as human powered bicycles were all widespread at the turn of the 19th into the 20th century. Not to mention the somewhat obvious wisdom of building places where it was both possible, safe and pleasant to walk – something humans were able to do for millennia prior to gadarene rush to rebuild cities to accommodate the automobile. 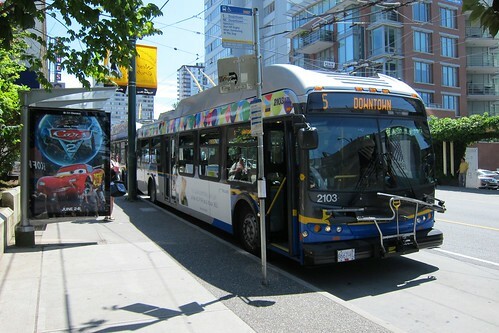 Or even something that seems revolutionary in Vancouver but has always been instinctive in older cities – places to sit down comfortably outside in public spaces without any payment being required. Something similar seems to be going on with the debate about the pipeline. I really do not think that the main issue is the possible impact of spills on either land or sea. It is the problem of burning ever more fossil fuel that worries me. The oil sands are one of the worst offenders simply because of the amount of energy it takes to convert tarry sands into liquid fuels. If we had better ways of moving ourselves around – and we could have very easily and relatively cheaply – then the oil could stay in the ground. Possibly not forever – since there are so many other really clever things we can do with petro-chemicals, for which there often fewer readily available alternatives. Burning the stuff or making non-biodegradable plastic bags is simply profligacy, given the increasingly precarious future we face. 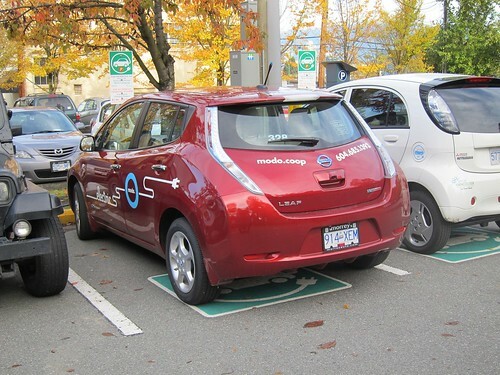 I recently posted a Press Release from Modo about their new electric vehicle acquisition – a Nissan Leaf. I did not write much and I used their picture. Today I was pleased to go for a ride in the car and take some pictures of my own. I was going to change the original post but maybe a photo gallery with comments is a better way to go. I found the car in the parking lot north of City Hall. 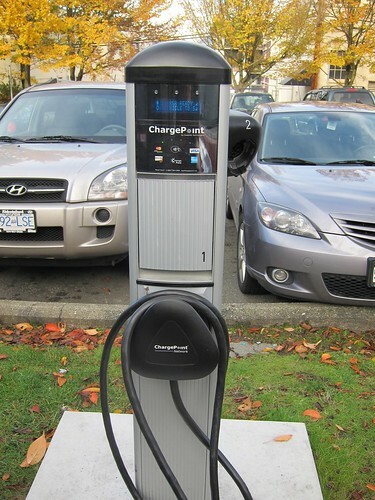 Modo has a row of reserved parking spaces here along the 10th Avenue side, but the EV charging station is roughly in the middle of the lot. Modo also organizes the City’s own car sharing program. 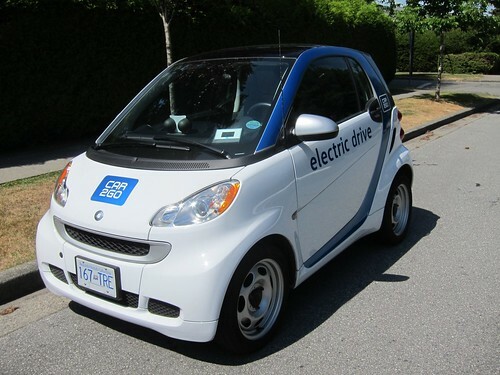 The City chose a Mitsubishi iMIEV for its program. I think if I had been parking this car, I would have backed into the stall, just to make the cable shorter and reduce the tripping hazard. In fact, if you have a choice, backing into a stall is always a better way to park, as most collisions in parking its occur due to people backing out. $1 an hour including juice seems a good deal to me. The choice of the City Hall lot was based in part on Modo’s knowledge of their existing car use from it. The average length of trip is 14km. 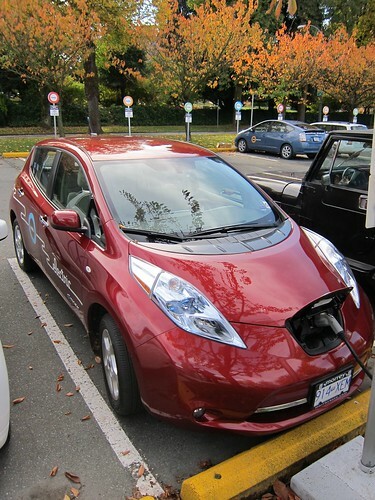 The Leaf we used was fully charged with a range of 140+ km available, so the probability of running out of juice for most users should not be an issue. You can see the empty line of reserved Modo parking spots behind the car. I was not a Modo member when I wrote this so I had to be content with the passenger, not the driver’s, seat. My impression is that this is a very comfortable, easy to drive and quiet vehicle. Electric cars can have quite startling performance simply because an electric motor has a great deal more low end torque than any IC motor. Since we were driving in mid afternoon city traffic, there was no speed or acceleration trial. The car does include a central display, which when I was in it either had the rear view camera (when backing up, which also included a parking guide) and when in forward motion a GPS real time map. One of the great advantages of car share membership is the wide range of vehicles available. Not only do you not need to own a car, but you can get a vehicle that meets the needs of the trip. Car coop members make far fewer trips by car than car owners – because they do not have the perverse incentive that ownership provides (“I have spent all that money, I might as well get some use out of the thing”). You can have a coop membership and not feel that you have wasted money if you decide that its a nice day for a bike ride, or that transit would be more convenient for some trips. For that reason Modo concentrates on the City – high population density and frequent transit is a good mix for the coop. They are not trying to encourage car use, but recognizing that for some trips in our metropolis a car is the best choice. But it has to be a real choice, not one forced by circumstances. Modo is trying to get into the suburbs. They would dearly love to have a car at Brighouse Station, for instance. Trouble is that most of the land devoted to parking in the centre of Richmond is private land. Indeed, as I have often lamented here, you are forced by the rules of the parking lots to take your car with you when you leave. You must not park in one place and then walk to complete several errands. That is one of the main reasons why traffic on Number 3 Road is always dreadful. Most of those drivers are making very short trips. Modo also is getting more and more approaches from developers, who like to provide car coop memberships out of the condo fees and thus reduce the number of parking spaces they have to supply. Quite how we could retrofit existing condos, by getting strata councils to adopt a car coop space as part of the amenities – the same way they provide swimming pools and recreation rooms – presents an interesting challenge. 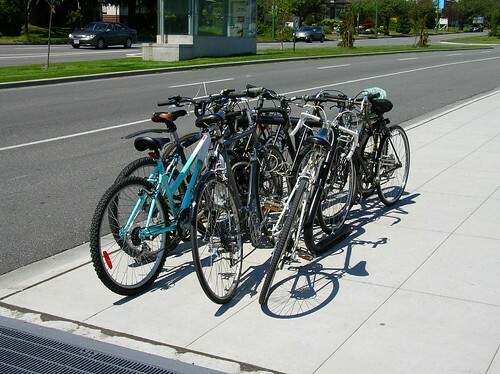 But some of those spaces thus released could be chain link fenced bike compounds. Car sharing is already good for the environment, due to the reduction of car trips. Making those trips zero emissions (and in BC most of our power comes from existing hydro) is a worthwhile bonus. 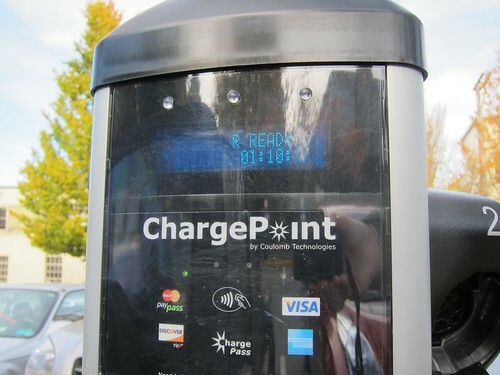 And coop members get to try a EV before most people – geeky transportation bloggers excepted. 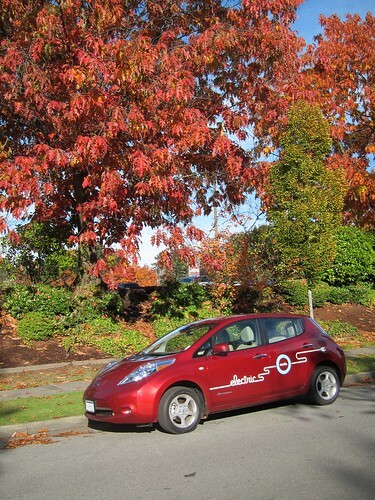 For what its worth, of the OEM EVs I have been in, the Leaf is by far the nicest. The Chevy Volt is not all electric – and it will be a long time before we see any hydrogen fuel cell cars here. 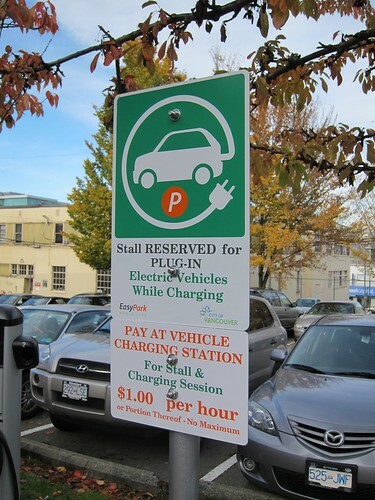 Plug in – for hybrids or all electric – does seem to be the best choice for now. Trouble is at present there are only ten Leafs in Canada. Lucky Modo members, then. 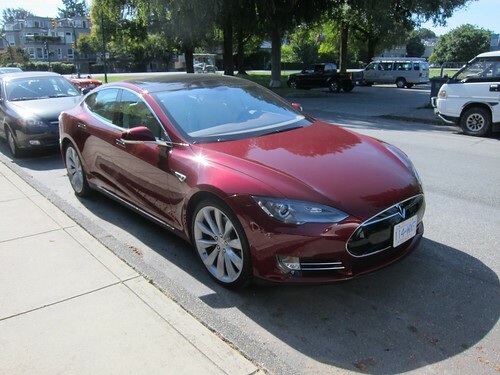 They [low speed vehciles] are, however, the only kind of electric car you can buy here now. No – you can get hold of vehicles which have been converted to be all electric. Or you could buy an older vehicle, take out the engine and replace it with an electric motor and a bunch of lead acid batteries. People have been doing this for many years, and the vehicles are legal on all roads and are capable of highway speeds. However, range is limited, and the weight of (and often space taken up by) the batteries also reduces carrying capacity. The reason they are not more widely used is that the cost of the batteries – which need to be replaced every two to three years – means that they cost as much to run as a gasoline vehicle. Lithium Ion batteries will better than lead acid – better energy density and more power, but also greater cost. 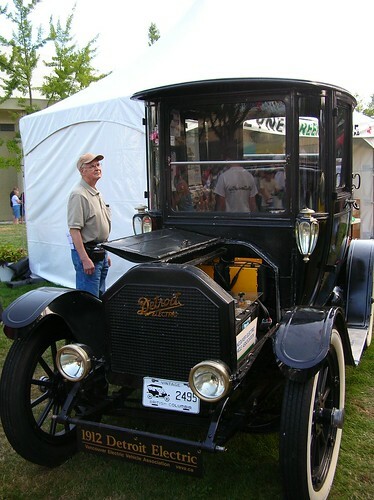 There is also nothing new about low speed electric vehicles – they have been around for over a hundred years. Battery cars outsold petroleum in the early years of the twentieth century – until the starter motor was invented. In England they were used for delivering milk – for as long as door step delivery persisted. When I was growing up in East Ham the Borough Council also used them for collecting salvage – both paper/cardboard and waste food (which was fed to pigs). What is hard to understand is why Transport Canada has been so obsessed with the “safety” of LSVs. Yes these vehicles have not been crash tested or fitted with the latest safety features, but at low speed they do not need to be. What we should be concerned about are the number of vehicles on the road that are capable of operating at speeds far in excess of the legal maximum. And that is not just the boy racers with the often illegal modification kits but cars straight off the production line. Why does TC obsess about vehicles which pose very little threat – if any – yet turn a blind eye to lethal weapons? Why is there no mandatory speed limiter required on high performance cars? (I know the answer, I am being rhetorical). Transport Canada denies it of course, but Ian Clifford of Zenn Motor Co, is blaming them for the fact that he still cannot sell his electric cars here, even though he has been selling them in the US for quite a while. Something about the definition of low speed vehicles and crash worthiness exemptions or somesuch. Bureaucratic twaddle of course. For most things automotive we just accept the US standards – but add daytime running lights and speedos in km/hr. No doubt the US also had to co-ordinate federal and state requirements, since it is the states that look after the roads – and only the interstates get federal funding. Not that you can take a slow speed vehicle on a freeway of course. So don’t buy a Zenn if your commute takes you across the Port Mann or through the Massey tunnel.